Designed to monitor corrosive liquids, the Model 6210 oval gear flow meter by Kytola is ideal for chemical dosing applications and industrial process control. As a positive displacement flow meter, the Model 6210 will reliably and accurately show the correct rate of flow despite changes in liquid viscosity and temperature. 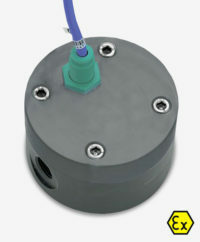 An alternative, ATEX construction (II 2GD c TX) is available for safe use in explosive environments. Please speak to our team for details.